Here’s a screenshot of where you all are from! Most readers are from the US of A, followed by Canada, the UK, and Australia (which makes sense from a language perspective) and thousands more visitors are from 119 other countries! The blog’s facebook page followers are said to be from 45 countries all around the world, and apparently communicate in 24 different languages! 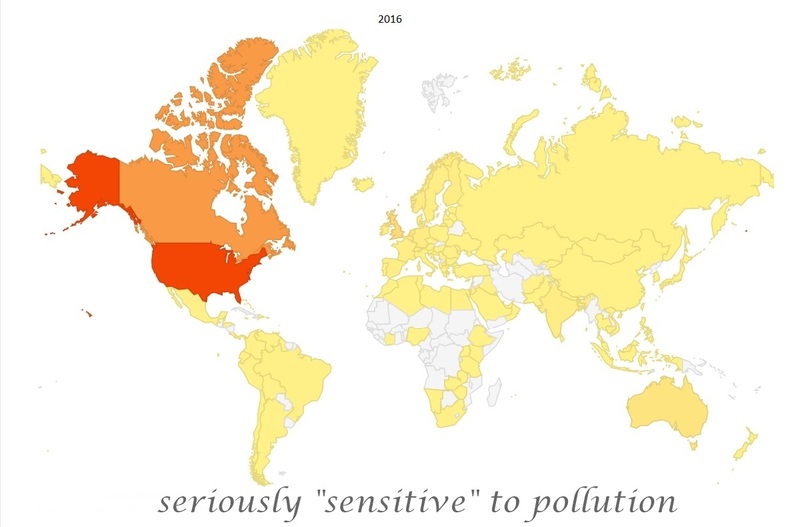 Being “sensitive” to pollution is truly a global issue! I wish there was no need for what I do here, that pollution wasn’t profitable, and that we could all access everything we need for health and well-being. Living beings were not designed to withstand 24/7 exposures to toxic pollutants, toxic foods, and wireless radiation (like from wi-fi and smart meters). Hopefully what I share with you all encourages you to eliminate toxic and harmful products and materials from your lives, and to speak up and out, so that we aren’t invisible to the world, because we are all over the world, we are all “sensitive” to pollution, and we are all in this together! This entry was posted in Disability, Environmental Health, Human Rights, Pollution and tagged allergies, asthma, autism, cancer, Chemicals, environmental sensitivities, Fragrance, global, hazardous air pollutants, IAQ, MCS, MCS/ES, multiple chemical sensitivities, multiple chemical sensitivity, petrochemicals, sensitive to pollution, toxic trespass, wireless. Bookmark the permalink. I didn’t set out to be doing this, and went public quite reluctantly, and only after I saw so many people suffering (and dying) in silence. If everyone who was “sensitive” to pollution knew and understood it, and spoke up about it, we could probably stop things from getting worse and start to turn things around pretty quickly! Thanks for speaking up! The more seeds planted the better! And soon, some of the seeds will be bearing fruits! If you want (and have the energy to do so), you could mention to both banks that fragrances and other toxic chemicals create barriers to access for people with disabilities. This is a human rights issue too, in addition to a health (air pollution) issue for everyone. I wish the uk was more enlightened about MCS. Canada the US and even Spain has fragrance free area’s The only doctors that consult here re MCS are really expensive. Chemicals are silently killing in droves. Its only us Canaries that can feel it as our immune system plays havoc. Rencently the Royal College of Surgeons and Physicians published a report that stated that 44,000 people a year died because of indoor pollutution and yet still nobody seems to act what is the matter with people!!! Dying for the scent. We don’t have safe access to health care here either… The handful(s) of “aware” doctors all charge a lot extra for what we need, as those services are not covered by the “universal” health plans, and none of them do house-calls or have truly accessible offices. Hospitals can be life or death trips themselves, so it’s really a toss-up which is worse, the emergency or what the exposures at a hospital will do to us. Most people with severe MCS/ES cannot go to a hospital under any circumstances as that would cause months and months of severe disability with no “safe” help available, or out and out death. Yes, some people and places are starting to get it (as so many of us are emerging)… which is great for people with mild MCS, but those places and people are still few and far between. Did you notice that the Royal College report mentioned people with “sensitivities” at least 3 times, and that they also mentioned indoor pollutants like air “fresheners”? That to me was a big leap of progress for a community that is reluctant to admit we exist. Also, a few years ago they issued something advising pregnant women to essentially live as if they had MCS (I wrote a blog post about that). So, doctors are beginning to notice that placing more importance on the economic interests of polluters and pharmaceutical companies is not good for patient health outcomes!